Yes! 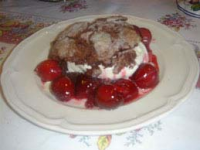 The fresh, local cherries are in the markets and it’s time to celebrate by making these very easy chocolate shortcakes and serving them with quality ice cream and cherries jubilee — a heated mixture of cherries cooked with brandy! The only thing that will take time is pitting the cherries. For the biscuits: Preheat the oven to 400 degrees. 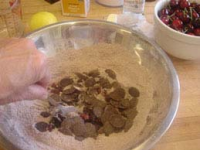 Stir the flour, cocoa, sugar, and salt together in a large bowl until well combined, then stir in the dried cherries and chocolate chips. Add the cream and stir until the mixture comes together into a somewhat stiff dough. 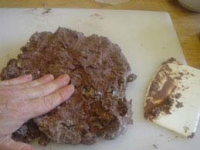 Turn out onto a clean cutting board and, with your hands, press the dough into a 6 inch square about 2 inches thick. With a long, thin knife, cut the dough into 9 (2 inch) squares. Dip the tops of the biscuits into the melted butter and then into the sugar, pressing lightly so it adheres. 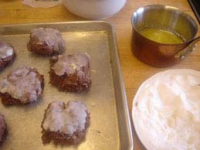 Place the biscuits 2 inches apart on an ungreased baking sheet. Bake for about 15 minutes, or until they’re light gold and spring back when pressed lightly. Set aside at room temperature for up to 4 hours. For the cherries: Combine the cherries and the 1/3 cup Kirsh in a bowl and let macerate for 30 minutes, tossing occasionally. Put half of the cherries, the sugar, and lemon juice into a saucepan and simmer over medium heat for about 5 minutes, or until the liquid begins to thicken. Remove from the heat, add the brandy and avert your face in case it ignites. Let the alcohol burn off. Simmer the cherry mixture until it reduces to a syrup. 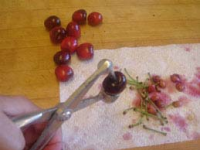 With a slotted spoon, transfer the cherries to a bowl and reserve. Add the remaining 2 Tbs. Kirsch to the syrup and set aside. 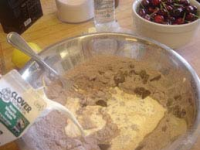 The cherries and syrup can be prepared up to 2 days ahead if refrigerated. To serve, preheat the oven to 350 degrees. Split the biscuits and put them into the oven for about 5 minutes, or until warmed through. Heat the cherry syrup in a small skillet over medium heat, add all of the cherries and the butter, and swirl the pan until the butter has melted and combined with the syrup. Center a warm biscuit bottom on 8 dessert plates or shallow bowls, add a scoop of ice cream and put equal spoonfuls of the cherries and their syrup on each, reserving a cup or so. Place on a biscuit top. Dollop the remaining cherries and syrup around or to the side of the biscuits. Note: For the home cook, you can make the biscuits ahead of time and keep in a tin at room temperature. And, I recommend cooking all the cherries with all the other ingredients just before serving instead of cooking half the cherries in syrup ahead and adding the other half later.